- Publisher Each of the men in this study found that out in their own unique way, and as you look at their lives you'll soon realize that there's no formula to following God. There are only principles He's given us, and examples. 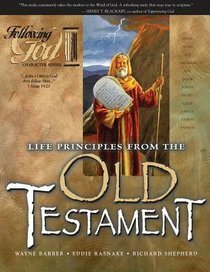 About "Life Principles From the Personalities of the Old Testament (Following God: Character Builders Series)"
Each of the men in this study found that out in their own unique way, and as you look at their lives you'll soon realize that there's no formula to following God. There are only principles He's given us, and examples. Barber is the director and keynote speaker for To Live is Christ Ministries, headquartered in Reno, NV. For 18 years he served as the Senior Pastor-Teacher of woodland Park Baptist Church in Chattanooga, TN. Richard Shepherd spent the last 20 years developing computer software in blue chip organizations. He is a qualified accountant and the bestselling author of "Excel VBA Macro Programming" and "Excel 2007 VBA Macro Programming".